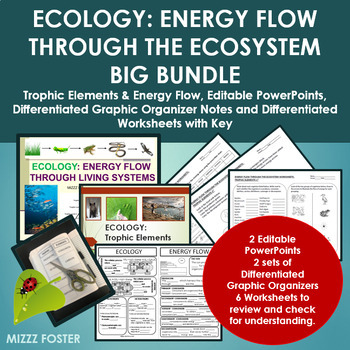 This big bundle contains two PowerPoints: "Ecology:Trophic Elements" and "Ecology: Energy Flow through the Ecosystem", two accompanying foldable graphic organizers which are differentiated and include teacher keys. 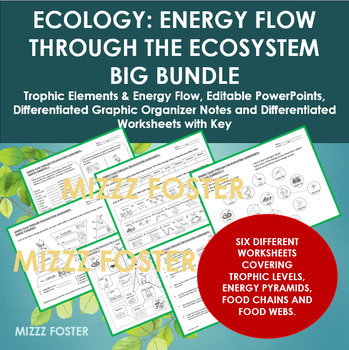 There are also six worksheets covering all the concepts taught to ensure students understand trophic levels, ecological pyramids, energy transfer, food chains and food webs. 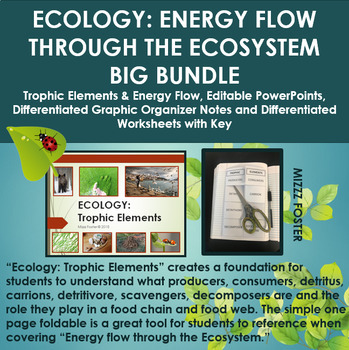 I like to start this unit with the Ecology: Trophic elements PowerPoint and foldable. I noticed over the years students have trouble remembering what producers, consumers, detritivores, scavengers, carrion , detritus are along with the arrow of food chains. The PowerPoint and simple foldable gives students a foundation they can reference while delving into the Energy Flow through the Ecosystem, food chains and food webs. It takes only one sheet of paper and you have a regular student version along with a modified foldable and teacher key. Two of the six worksheets check for student understanding over this topic and can be used following the PowerPoint. 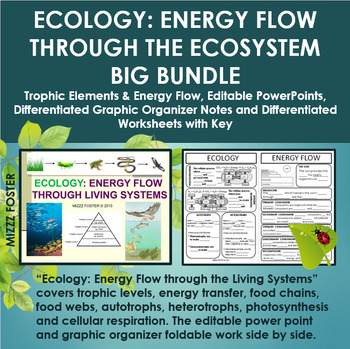 The next PowerPoint I cover is the "Ecology: Energy Flow through the Ecosystem." Here students will learn about the energy flow through the ecosystems beginning with an overview of photosynthesis and cellular respiration, ecological pyramids, trophic levels, food chains and food webs. Students will calculate how much energy is retained and lost and this foldable has some comprehension questions at the end. Two of the six worksheets focus on ecological pyramids and trophic levels. The last two worksheets focus on food webs. There is a total of six worksheets. You can use the all together or as you cover each topic.